Augustatus Kuningham, artist unknown, c.1780, Naval Historical Center. The subject of this piece, Gustavus Conyngham, lived a colorful life as a captain in the Continental Navy. Though more than one person has referred to him as a "pirate," there's little evidence to support that. More likely, he was decried as one by the British, as he was a commissioned officer in the navy of an unrecognized state. They gave him the moniker "the Dunkirk Pirate." The truth of his story is one of daring escapes, scores of prizes, and a career lasting from American Independence to the War of 1812. The artist of the French engraving above goes so far as to declare Conyngham the "Terror of the English." 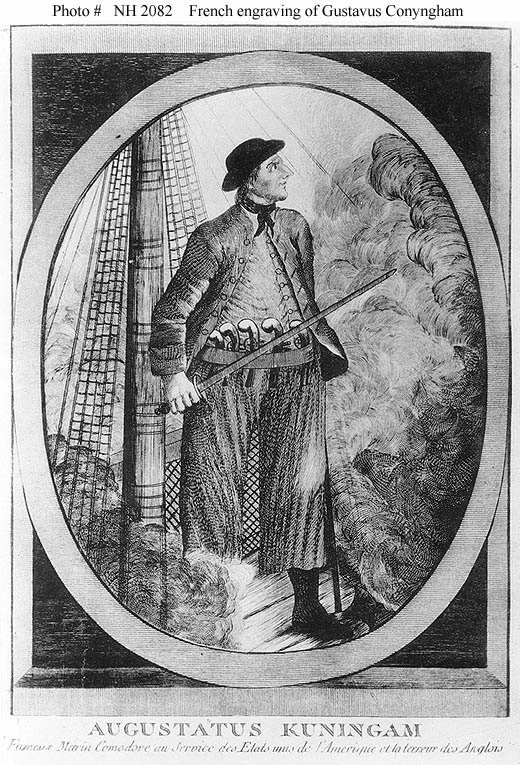 Unlike other contemporary images of Conyngham, which portray him in his Continental Navy uniform, this French print shows him in the dress of a common sailor. 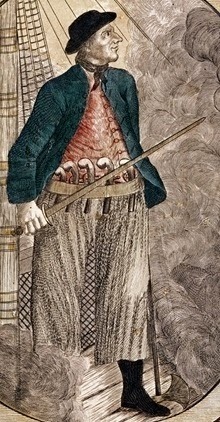 The preposterous brace of pistols, reinforced by a sword in one hand and an oversized boarding axe in the next, and combined with the common tar's slop clothes, suggests a man willing to brawl as well as lead. This colored version of the above was buried in one of my folders without attribution. If anyone can link me to the appropriate site, I would appreciate it. Conyngham wears a short brimmed black round hat, a black neckcloth that hides his collar, a single breasted blue short jacket with cloth buttons and no cuffs, a single breasted red waistcoat, white slops or loosely fit trousers, and black ribbed stockings.